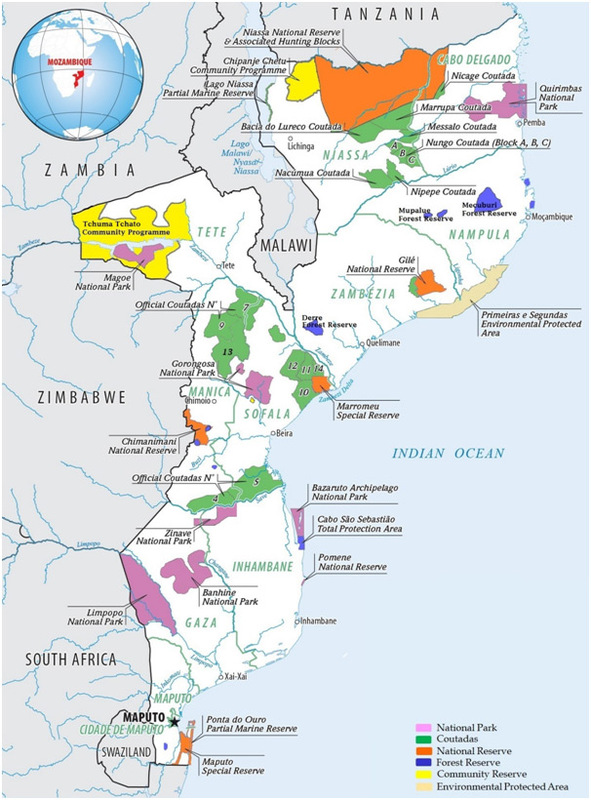 The National Network of Conservation Areas, led by ANAC, manages 7 national parks, namely Quirimbas, Gorongosa, Mágoè, Bazaruto, Limpopo, Zinave and Banhine, and 12 national reserves, namely Niassa, Gilé, Marromeu, Lake Niassa, Chimanimani, Pomene, Malhazine, Ponta de Ouro and the Inhaca Biological Reserve, the Cape São Sebastião Total Protection Zone, and the Environmental Protection Area of the First and Second Islands. Also falling within the framework of ANAC management are other categories of conservation areas, such as the case of official hunting reserves and game farms, intended for the development of safari tourism and also the 3 Community Conservation Areas of Mitchéu, Tchuma Tchato and Chipanje Chetu, and the Forest Reserves. Through its network of conservation areas, Mozambique possesses a very rich biological diversity, bringing together separate ecosystems, both terrestrial and marine. This diversity of ecosystems plays an important role in the provision of environmental services. In Mozambique, the conservation areas are management by the National Administration of Conservation Areas (ANAC), a body supervised by the Ministry of Land, Environment and Rural Development (MITADER). Despite the constraints represented by population pressure and by the demand for land for various economic projects, the percentage of the national territory dedicated to conservation is tending to grow, with the declaration of new parks and reserves. This noteworthy fact shows the country’s awareness of its responsibility to preserve the natural heritage with which it is endowed. One of the great challenges that Mozambique is facing in its effort to consolidate its network of conservation areas – which currently represents almost 26% of the land area of the national territory – is the lack of financing. The revenue which the parks and reserves raise, including the revenue from tourist concessions, are still modest and the allocations from the State budget are manifestly insufficient. It is calculated that, in 2014, the contribution from the international community covered about 81% of the running costs of the national system of conservation areas, estimated at 18 million USD. To handle the effective administration of the National Parks and Reserves, official hunting reserves, game parks and other conservation areas legally instituted and placed under its administration. To conserve biological diversity within the National System of Conservation Areas, to guarantee the sustainable use of the conservation areas, and to develop infrastructures to manage and develop economic activities and establish partnerships for the development of the areas under its management.